One of our problems with alcohol in the USA is immature behavior regarding it -- from adults. More than a third of Americans don't drink any alcohol at all. Despite wine being all over the Bible, elements of the religious right are always trying to bring back Prohibition in baby steps. 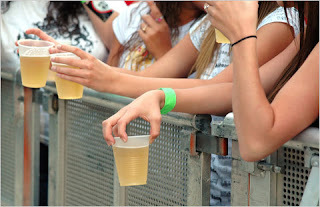 What sense does it make to prevent people from buying beer during church on Sunday, as many cities' laws forbid? One of the most effective ways to exploit America's post-Prohibition prudishness is to bring children into the argument. That's how direct shipping is always challenged by wholesalers seeking to maintain their power: the idea that teenagers will order a case of wine and drain it between the UPS guy's arrival and their parents' return home from work. I was delighted Saturday to read online at the New York Times a batch of letters from young adults regarding their early drinking experiences. I won't say much more on the topic today, because I strongly urge you to read what these people have to say. One parting shot, though: Did you know George Washington was a distiller? And that a replica of his still will be cranking out rye whiskey at Mount Vernon starting July 1? America: Drinking responsibly for more than 230 years, and it all starts with parents sharing a glass with their kids, rather than refusing to admit alcohol is a part of life. Blake, I cannot agree with you more. My parents exhibited to me from my earliest dining memories that you drink wine with your meal and you do not overindulge. Now, my parents would attend tastings and wine-related charity events, entertain winemakers in our home and kept a fully stocked bar that they never locked in full view of us kids. My parents let me take a sip once in awhile starting at age 5 or 6. When I got to high school, I didn't want to drink. I did not want to drink with my classmates who drank whatever they could to get so wasted their exploits would be legendary come Monday morning. Anyway, I agree with you. I probably just echoed what the link you posted said, but honestly now in my late 20s, I'll have a drink with a colleague or a bottle with my husband over dinner, but rarely, if ever, do we drink with the intention of getting behind the wheel or getting so inebriated we feel it the next morning. I owe my outlook on wine and spirits to my parents.